I'm looking into the Hyundai Santa Fe's. My stepmom has one and loves it! I think they're adorable and the perfect sized SUV. I love my honda civic but lets face it, she has 135,000 miles on it and was a great first car but moving on into the real world in a few years I need something bigger and more practical. Wow....I must becoming a grown up if I'm thinking into the future, mentioning the real world and thinking more practical. Yikes. All so exciting but scary at the same time. I have a sunroof in my civic and let me tell you, I LOVE IT. So I'm crossing my fingers my new car has a sunroof because that will be so sad in the summer. 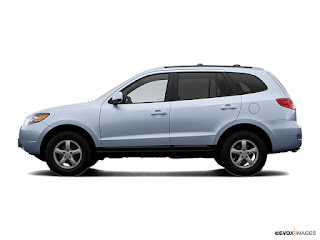 And I would love if my Santa Fe was navy because it's my favorite color, but if it's not I think I'll survive. As long as it's not bright red or some hideous color, I will be okay. test drove this one Monday; color is so pretty in person! !